The Rancho San Pedro is the site of the first Spanish land grant in California. It was given in 1784 by King Carlos III to Juan Jose Dominguez, a retired Spanish soldier who came to California with the Portola expedition and Father Junipero Serra. The original grant encompassed 75,000 acres, including the entire Los Angeles Harbor area. The land eventually passed to Manuel Dominguez, who built the adobe home on the property in 1826, which serves today as the Dominguez Rancho Adobe Museum. Dominguez was active in the civic life of early Los Angeles, serving on both the City Council and County Board of Supervisors. He was elected Mayor of Los Angeles in 1832, and was one of the signers of California's first Constitution in 1849. In 1910, the Rancho San Pedro was the site of the first Aviation Meet in the United States. 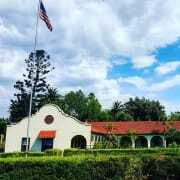 The Dominguez Rancho Adobe Museum is California Historical Landmark Number 152 and in 1976 was placed on the National Register of Historic Places by the United States Department of the Interior. Dominguez Rancho Adobe Museum accepts donations. Donate Now. Would you recommend Dominguez Rancho Adobe Museum? The museum grounds are beautiful, quiet and peaceful. The people here are very friendly. A wonderful place to gain new friends and learn about California's history.